Coming off an encouraging team effort in a 14-6 road loss to the 3A Kimberly Bulldogs last Friday, the Wood River High School varsity football team will jump right into its 4A Great Basin Conference schedule against a tough foe. The Minico Spartans arrive at Hailey’s Phil Homer Field Friday, Oct. 4 for a 7 p.m. game. Wood River (1-3, 0-0 league) will try to snap a three-game losing skid. Minico will try to keep alive its bid for one of two Great Basin state playoff berths. Minico (2-3, 1-1), having won or shared seven of the last eight GBC grid titles, is on the outside looking in because of a 40-19 home loss to Twin Falls Sept. 20. Minico has now dropped three of its last four games, has yielded 34.2 ppg on defense and will face a daunting road schedule in the month of October. But Minico’s 60-14 road loss Friday to one of Idaho’s top 5A teams, Coeur d’Alene (2-3, 39.2 ppg offense) doesn’t overshadow the strength of the Spartan program under coach Tim Perrigot. The Wolverines, routed at Gooding the previous Friday, regrouped and pulled together as a team at Kimberly. They out-rushed Kimberly 155-139, out-passed the ‘Dogs 138-108 and allowed only two touchdown passes late in the second quarter. Stilling said, “We got a superb effort across the board Friday. We were down 14-0 but the men fought back and competed all night. “(Senior co-captain) Cooper Bailey did an exceptional job stepping up and taking on a leadership role. (Sophomore quarterback) Alec Nordsieck battled a nagging ankle injury all night to drive us down the field with a chance to tie at the end of the game. Junior back Champe Kotara (16 carries, 54 yards) put Wood River on the board with a six-run touchdown run late in the fourth quarter. Junior Zach Swanson (10 carries, 63 yards) led the ground game. Nordsieck (7-for-14, 138 yards) completed passes to Bailey, Swanson, Austin Savaria and Gunner Gibson. Nordsieck intercepted two passes. Bailey and Gibson led the defense with six tackles apiece, while Cody Richmond and Hagan Barsch added five each. Host Twin Falls (3-1, 2-0) nipped Jerome (2-3, 1-1) by a 19-14 score Friday and appears to have clear sailing to its first outright Great Basin title since 2009 with upcoming games against Wood River, Canyon Ridge (0-4, 0-2) and Burley (3-1, 1-1). 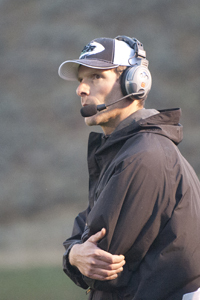 Burley snapped a string of nine straight league losses with a 33-12 home win over Canyon Ridge last Friday. Kimberly—Riley Charlton, 15-yard pass from Dallin Brady (Bryce Wilson kick); 2:08 2nd (7-0 K). Kimberly—Riley Charlton, 65-yard pass from Derek Wadsworth (Bryce Wilson kick); 0:46 2nd (14-6 K). Wood River—Champe Kotara, 6-yard run (run failed); 0:33 4th (14-6 K). Rushing—Zach Swanson 10-63; Champe Kotara 16-54, 1 TD; Cooper Bailey 10-20; Hayden Thayer 2-11; Alec Nordsieck 5-5; Austin Savaria 2-2. Passing—Alec Nordsieck 7-14, 138 yards, 1 interception. Receiving—Cooper Bailey 3-59; Zach Swanson 2-27; Austin Savaria 1-42; Gunner Gibson 1-10. Kickoff returns—Zach Swanson 2-28; Cooper Bailey 1-25; Hayden Thayer 1-16; Champe Kotara 1-8. Tackles leaders—Cooper Bailey 6, Gunner Gibson 6, Cody Richmond 5, Hagan Barsch 5, Austin Savaria 3, Christopher Lentz 3, Jon Reigle 3, Champe Kotara 3, Izaac Easterday 2, Alec Nordsieck 1, Dee Jay McMurdo 1, Parker Bingham 1. Rushing—Casey Holmes 17-79; Derek Wadsworth 7-27; Dallin Brady 7-25; Riley Carlton 4-5; Richie Silvaz 1-3. Passing—Dallin Brady 3-7, 32 yards, 1 TD, 1 interception; Derek Wadsworth 3-6, 76 yards, 1 TD, 1 interception. Receiving—Riley Carlton 2-80, 2 TD; Jesse Sutherland 2-17; Dallin Brady 1-8; Casey Holmes 1-3. Tackle leaders—James Conway 10, Chris Chandler 8, Thomas Lentz 6, Colby Doyea 4, Jesse Sutherland 3, Adan Diaz 3, Tristan Kulhanek 3, Joe Tews 2, Richie Silvaz 2, Riley Carlton 2, Dustin Diaz 2, Anfernee Vega 2.